Great deals directly from The Rescue Company on all equipment and accessory needs. 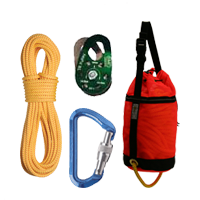 From basic whistles to high tech underwater video systems, we sell everything you could possibly need for outfitting an advanced technical rescue team or just a safe day on the river. With brand names including Kokatat, Oceanid, MTI, Solgear and others, we are sure to have the quality and variety of equipment to suit your needs. Feel free to contact us regarding any questions you might have about gear bags and safety equipment lists.